General Online Ordering — Thank you for your continued patronage! THANK YOU FOR YOUR SUPPORT of CLEMSON BLUE CHEESE! 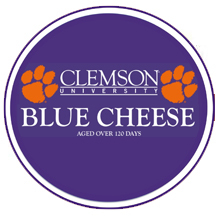 Distributor’s Option — After registering in our new online ordering system, please email bluecheese@clemson.edu to have your account validated. Our campus retailers do not accept online orders or ship products on behalf of Clemson Blue Cheese. If you have any questions or concerns please contact Clemson Blue Cheese.